I’m not thinking about the America eagle, or this year’s Thanksgiving turkey or even the late Detroit pitcher Mark Fydrich known as “The Bird” (loved that guy when I was a kid..RIP). I’m thinking you know, The Bird. This is a family blog though so I won’t just come out and say it. Instead I’ll call The Bird a safe acronym like “TB” for the remainder of this post. And since the acronym “TB” is more commonly known as Tuberculosis (which is a heck of a lot worse than this other TB I’m talking about) by comparison, mine is pretty tame. What I will say and list for you, are the times during a typical day or a week that I feel I am getting TB (not Tuberculosis type) from businesses. Not an “in your face” blatant nasty service experience that everyone writes and complains about, but a sudden unpleasant little message you flip in my general direction. And that is not good. Maybe these little affronts are a sign of worse things to come from this experience, this business relationship. Maybe these little affronts stop the relationship process really before it even starts. My guess is that businesses may not have a clue they are doing this and if that’s the case, please get a clue. And if it is being done on purpose, quit it. The Bell. 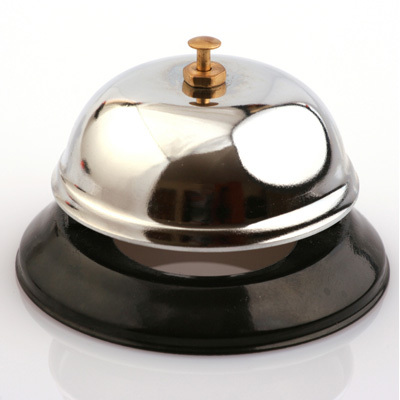 If you’re a small business or even a large one and aren’t drooling at the prospect of a prospect walking in your door but instead place a little silver bell for me to ring to get your attention, then you are giving me TB. Guess I’m not that important. I suggest a mirror, a dog or some sort of bell on the door I open that gets your attention before I need to. Flat Screen & Standard Definition TV: Have a nice bar? Have a nice place casual dining establishment? Great, I love it. But every time you hang that 47” screen over your bar but only show standard definition programming it’s like giving me TB. If you can’t cough up the costs or work out the deal to broadcast HD don’t insult me with the blurry picture on your beautiful television screen while I sit paying 500% margins on your over priced local brew. What’s next? Skimping on the soap for the dishwasher? “noreply @..” Ever get one of these emails? If your business sends out any emails with the sender labeled like this for any reason, you might as well give me TB. Staff the darn mailbox or forward it to someone who cares because if the recipient is your customer and he or she cares to reply; you should care to listen. The 24 Hour Sales Cycle (NOT); Ever get a LinkedIn invite one day and then an invitation to spend money the next? Ever get a ReTweet on Twitter or a nice comment on your blog post one day and then a pitch from that person or business the next day? I have. I’ve gotten them from former colleagues, friends, people and businesses that I know or knew. Ugh. Faux Networking is TB in capital letters (I mean like really big capital letters). TB is fowl. And while you undoubtedly have your own examples of TB in the marketplace (and please feel free to share), figuring out if you, your business, your team or your department is doing TB innocently to customers/prospects is important to think about too. It may be hard to spot or put a finger on so to speak but it’s well worth the look.